Swans fans are in the corner (lower and upper tiers) between the South & West Stands. It’s a climb to reach the upper tier, but the view is superb and decent leg room. With little space between away and home fans there’s plenty of banter and a great atmosphere, but be careful around the ground; consider keeping colours covered. There’ll be repeated warnings by stewards to stay seated and ejections from the ground are likely. Bottles of Carlsberg are sold, but not at half time. Visiting fans might not realise, but White Hart Lane has the smallest pitch in the Premier League, measuring just 100m x 68m. A chance to get some Christmas shopping, if you’re that way inclined, with every shop imaginable there. London has everything, from theatres to museums to concerts. If you’re looking for great deals on theatre tickets, then go to London Theatre Direct. If sightseeing is more your thing, then be sure to check London Discounts for some great deals on the Coca-Cola London Eye, The Shard Tower, Madame Tussauds, Tower of London, etc. Being London, you are spoilt for choice for places to stay and you can easily find accomodation to suit any budget. 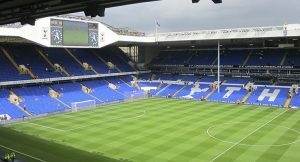 Tours of White Hart Lane stadium are available to buy online or by calling 0844 844 0102. Options are with or without food, with or without Spurs legend Pat Jennings. The Cure are at Wembley Arena (HA9 0AA) on the Thursday, Friday and Saturday night at 19:00, tickets are £29.50 – £57.50. There a many ice rinks in operation throughout January, including ones at The natural History Museum, Somerset House, Hampton Palace, The Tower of London, Broadgate, Canary Warf, and Wembley Park. The O2 (SE10 0DX) has a 10 month interactive exhibition with loads of models and props – Star Wars Identities from 18th November with tickets from £15 – £25. On the Monday and Tuesday, it’s the Red Hot Chili Peppers, tickets are £50-£80. Hogwarts in the Snow at Warner Brothers Studio Tour – The Making of Harry Potter (WD25 7LR) goes from mid-November to the end of January. Tickets are from £27 and from the Warner Brothers Studio website. On the Sunday 10am – 8pm it’s Kingston Christmas Market (KT1 1BW). It has over 100 wooden chalets, and a heated marquee and two large outdoor bars, along Kingston upon Thames’ Ancient Market Place and its surrounding streets. There’s also a traditional merry-go-round, glittering Christmas tree and several large-scale Nutcracker Kings and Soldiers. The choice of pubs for away fans is limited to say the least! ‘Haringey Irish Club’ (N17 8DX) is opposite White Hart Lane station. It has 2 large bars with Sky TV, offers food and parking is £10. If leaving the train at White Hart Lane, go out of the metal gates and straight down the road in front of you. After 200 yards there’s a car park on the left hand side, the club is in there. The ‘Elmhurst’ (N17 6XE) on Lordship Lane, is a 10 minute walk from the ground. It’s a large mock Tudor style pub with many Sky Sports screens. Home and away fans mix without problems. ‘The Three Compasses’ (N17 8EJ) on Queen Street (behind Middlesex University), is a 5 minute walk from White Hart Lane Station. Away fans not wearing colours should be fine at ‘The Antwerp Arms’ (N17 8AS) a 10 minute walk and ‘The Beehive’ (N17 9BQ) who do quite a nice menu is a 15 minute walk. Also near to Bruce Grove Station (turn right out of the station and along on the right) are two pubs by each other, ‘The Elbow Room’ (N17 6QA), generally home fans only and ‘The Ship’ (N17 6QA), away fans are welcomed. They are a 15 minute walk up Tottenham High Road to the stadium. You can head for central London before the game. There’s a Wetherspoon, Hamilton Hall (EC2M 7PY) at Liverpool Street Station, and a Cornish pasty shop opposite. Trains from here go to White Hart Lane. If you decide to take the long walk from Seven Sisters tube station to the stadium, there are loads of pubs on the way. On street parking is zero around the stadium as a Controlled Parking Zone is in place a mile around the ground; parking for residents and blue badge holders only. Private car parks nearby charge up to £15. If you park around the area, look at notices attached to lamp posts, as cars can be towed away. White Hart Lane Station is the nearest to the stadium, and only a few minutes walk away. It is served by trains from Liverpool Street. The best station to get to White Hart Lane from is Northumberland Park. Come out of the station and cross the road and you are in Park Lane, then a 10 minute walk to the ground. The nearest tube station is Seven Sisters (Victoria Line). The ground is a 20 minute walk, but plenty of buses run up Tottenham High Road to the ground. Not many go past the ground, those that do have numbers that end in a 9, so take 149, 249, 279 or 349. You can also get a train from Seven Sisters to White Hart Lane station.